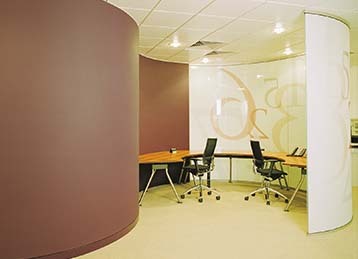 From a simple meeting room to sub-division of a full office floor, our office partitions provide flexibility, security and help businesses save costs by making office spaces more efficient places to work. Your business may need to create a new breakout area to improve staff wellbeing or create a new meeting room for colleagues to collaborate on projects or even just an office to get the manager away from the team to allow for strategic time. In many cases our clients are looking to sub divide a large space into smaller offices. Our solid wall partitioning service quickly builds new walls to segment the space and the decorating team will ensure that the new interior walls are completed with electrical points, data and communication ports and decorated making your new rooms ready to use. If you require more versatility with your office interior then consider modular office partitioning systems. Sliding screens, gated doors and folding wall systems can be used to reconfigure your office internals opening up new spaces or closing down rooms into dedicated offices as required. 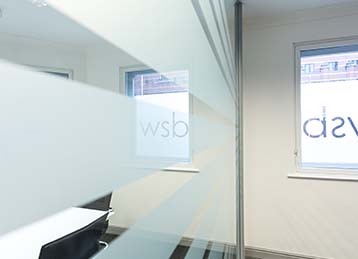 Installed without visible pillars, frame less office partitioning solutions deliver sleekness to your office interior and look great when adorned with frosted glass or your company logo. 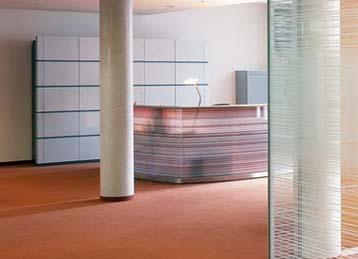 The glass partition is the most common solution for new offices or breakout areas as it allows for that open office feel but with the privacy of a smaller room. It is our commitment to delivering the highest quality assurances for our clients. That is why all office partitioning systems with Building Interiors are manufactured to the highest standard and colour ranges are powder coated and are fully tested to the relevant British Standards.